This is another one of those interesting fan theories that I occasionally see bouncing around the internet. I especially like it because, in a series that is frankly lacking in diversity, the idea that any of the characters would have anything remotely different about them is interesting to me. Not like being left-handed is much of a big deal anyway, but that’s about as close as we could hope to get. So today we’re going to take a deeper look into the theory about our (possibly…) favorite left-handed Sailor Soldier! Rei uses her left hand to draw the bowstring in Mars Flame Sniper, so she might be left-handed. Oh, you expected more proof in support of this theory? Nope, that’s about it. While I want to believe that this theory has some sort of basis in truth, unfortunately I just can’t really get behind Rei’s left-handedness purely on the basis of her Flame Sniper attack. But instead of going through the series and finding every single screenshot/manga panel where Rei seems to use her right hand as her dominant hand — which would frankly be really boring — we’re going to take a look at why this doesn’t actually support the theory, and how it could actually be proof of the opposite. I like the challenge of trying to solve mysteries that don’t actually have answers. Evil Flame Sniper = Frame Sniper? So back to our original statement! 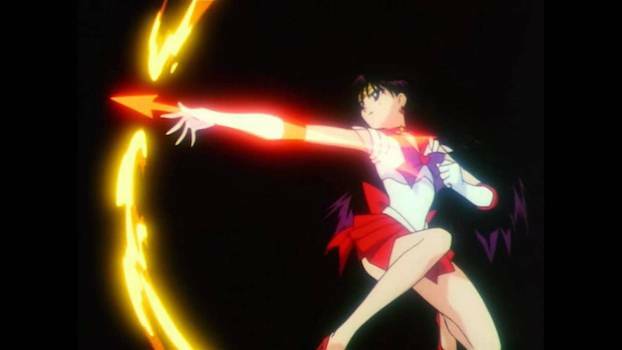 What the theory is basically saying is that since Rei is seen drawing back the “bowstring” with her left hand in her Flame Sniper attack, she could be left-handed because one would typically be using their dominant hand to draw the bow because it’s stronger. However, kyudo makes no accommodations for left-handed practitioners.2 There are no left-handed bows, nor left-handed shooting styles. So even if she were left-handed, Rei still wouldn’t be drawing the bowstring with her left hand. It’s simply not done. But I think there’s an even more fundamental flaw with this theory: that she would even be drawing with her dominant hand in the first place. If you watch the Flame Sniper animation multiple times, as I did when putting together this article, one thing becomes evident: there is no bowstring. And why should there be, it’s magic! Looking even closer, her hand doesn’t even hold the bow. 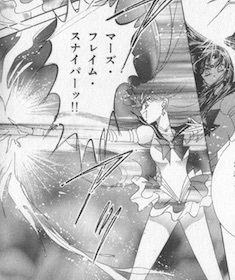 The better way to interpret this attack is that Rei is using her hands to aim and focus the power of the Mars Arrow and to send it launching into the enemy. In that case, it actually makes a lot more sense for Rei to use her right hand, which also happens to be the hand closest to her eye in this attack, to aim and her left hand to “draw” the arrow back to prepare to shoot. Taken that way, this would actually support the idea that Rei is right-handed because her aiming accuracy would be much higher with her dominant hand. With all that in mind, I think we can safely say that Rei probably isn’t left-handed, absent any further evidence supporting this theory. In all likelihood, the direction of Sailor Mars’ attack was probably determined entirely by how it looked on the screen/page. But that doesn’t mean I’m not willing to overanalyze the issue! I’ve never really thought about it too hard, but my pick for a left-handed Sailor Soldier would actually be Setsuna. 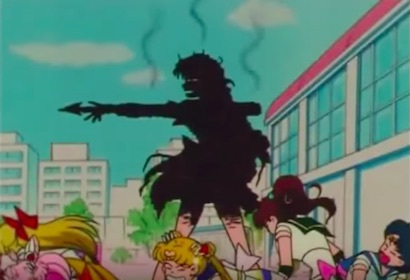 Though definitely not consistent across all art, many anime and manga pictures of Sailor Pluto show her posing with the Garnet Rod in her left hand. Not that it means much. But how about you? 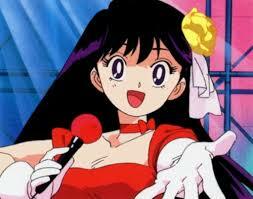 Are there any left-handed Sailor Soldiers I missed, or is there any extra evidence — for or against — that I glossed over? Let me know! It’s an interesting point of view, but I myself don’t think Rei or Setsuna is a lefty. That’s simply because, In the transformation sequence, they hold their transformation wand with their right hand. So they would hold it with their dominant hand so as not to fail to transform by dropping it. Although not directly related to the subject, Usagi also shows an interesting behavior in her transformation. In R and Stars season, she passes her left hand over her brooch in the very beginning of her transformation, but in S season, she uses her right hand to activate the brooch. While as you note, it doesn’t actually matter because of the fact there’s no string and she’s not actually holding the bow, I should note that there’s some additional factors that’d potentially apply if it were an actual bow. First is that one’s dominant hand is usually (tho not always) opposite from one’s dominant eye. For (western) archers, this leads to having to make the decision between higher draw strength or better aim. Some prefer to go for the dominant hand for strength, and just accept that their aim won’t be as good, while others prefer to accept a slight (assuming they practice sufficiently, the difference won’t be significant) drop in strength by using their off-hand, so as to be able to use their dominant eye. Additionally, it’s common that one hand has better control when under stress, while the other has greater strength, thus leading to yet another choice of tradeoff. This goes along with the way the limits in the brain work, as your brain will actively lock down some of your muscles if you try doing certain things that you can’t control (preventing you from releasing the string by locking your fingers if there’s too much pressure on your fingers for you to control it). So sometimes, it’s better to hold the bow with your dominant hand, and use your offhand to control the string.